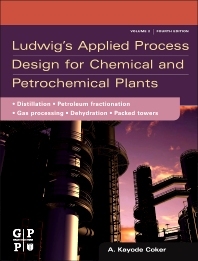 The Fourth Edition of Applied Process Design for Chemical and Petrochemical Plants Volume 2 builds upon the late Ernest E. Ludwig’s classic chemical engineering process design manual. Volume Two focuses on distillation and packed towers, and presents the methods and fundamentals of plant design along with supplemental mechanical and related data, nomographs, data charts and heuristics. The Fourth Edition is significantly expanded and updated, with new topics that ensure readers can analyze problems and find practical design methods and solutions to accomplish their process design objectives. A. Kayode Coker, Ph.D., is an engineering Coordinator at Saudi Aramco Shell Refinery Company, in Jubail, Saudi Arabia and is a consultant for AKC Technology in the UK. Prior to this he was Chairman of the Chemical and Process Engineering Department at Jubail Industrial College. He has also been a chartered scientist and a chartered chemical engineer for over 30 years. Coker is a Fellow of the Institution of Chemical Engineers. UK, (C.Eng, CSci, FIChemE) and a senior member of the American Institute of Chemical Engineers (AIChE). He holds a B.Sc. honors degree in Chemical Engineering, a Master of Science degree in Process Analysis and Development, and a Ph.D. in Chemical Engineering, all from Aston University, Birmingham, UK. He also has a Teachers’ Certificate in Education from the University of London, UK. He has directed and conducted short courses in both the UK and for SABIC industries in Saudi Arabia. His articles have been published in several international journals, he is an author of four books in chemical engineering and a contributor to the Encyclopaedia of Chemical Processing and Design, Vol. 61. Coker was named as one of the International Biographical Centre's Leading Engineers of the World 2008.